Rinpoche comes to Taos, New Mexico, USA for the FPMT Board meeting at the end of September. Following this, Rinpoche has accepted Ksitigarbha Study Group’s request to give Medicine Buddha initiation in Taos on October 4th, and Vajrasattva initiation at Thubten Norbu Ling in Santa Fe on October 5th. Merry Colony in the FPMT Education Services was requesting Rinpoche to identify the sadhana to be used as the basis of the Mahamudra retreat at Buddha House next year – and this is Rinpoche’s interim response! ‘Extensive sadhana in the morning of the kangaroo, after lunch is koala sadhana – as everyone can sleep, at the beginning of the sadhana they can have eucalyptus leaves in their mouths, and have some pieces hanging from their noses and sticking out some stems from their ears, evening sadhana can be extensive sadhana of the millipede and then in the evening they can do cockroach dedication. Rinpoche said he already mentioned this sometime back to them. One of your Dharma sisters Venerable Jan Fitzgerald has just died while in the care of our Hospice (Tara Home) at Land of Medicine Buddha, here in California. Venerable Jan received a lot of care and support from the local Sangha here as well as the lay Dharma brothers and sisters. She passed away 2 days ago and her body is still lying at Land of Medicine Buddha with around the clock prayers being done for her by the Dharma community here. This is a very special time that will happen to all of us. I want to mention here to the monks and nuns of FPMT that the most important time to support each other is when we die. We need to support the mind in order to have the best chance of a good rebirth. I want all of you to understand how important it is to support each other at this special time. We have a special relationship with each other as ordained brothers and sisters so please pray for Venerable Jan and especially recite the King of Prayers for her now. Venerable Jan had cancer and was about 50 years old. (And of course this advice is true for all of us in the FPMT family). ‘My very dear Colin the bodhisattva director and all the bodhisattva members of the Chenrezig Center, spiritual coordinator, secretary, bookkeeper, cooks, cleaners of course, very wonderfully inspiring Sanghas especially, more specially Geshe Tashi who is inspiring and bringing them to enlightenment. Thank you very much for everything you do for you and sentient beings and teaching of the Buddha, and ……me. This is also to take opportunity to express billion of thanks for making all stupas on the special days of the Buddha. Haha Haha Ha Ha Ha Ha Ha Ha Ho!! It can never be finished repaying to you even for reciting each mantra, om mani padme Hum, leave aside for all the big numbers. How blissful you made me, Wow! Thank you! (When Rinpoche says ‘each mantra’, Rinpoche is referring to the annual Mani retreat at Chenrezig Institute, which is done on Rinpoche’s advice. This year they recited 103,700,240 manis, (including a substantial contribution of approximately 15 million mantras from Mongolia), which were dedicated to the fulfillment of His Holiness the Dalai Lama’s wishes, to His Holiness’ long life and continued guidance, to Rinpoche’s health and long life, for Tibet’s freedom, for Lama Osel Rinpoche, for the endurance of Lama Tsongkhapa’s teachings, to pacify all sentient beings’ sufferings of body and mind, and for anyone coming to Chenrezig Institute to realize Bodhicitta in their minds immediately. 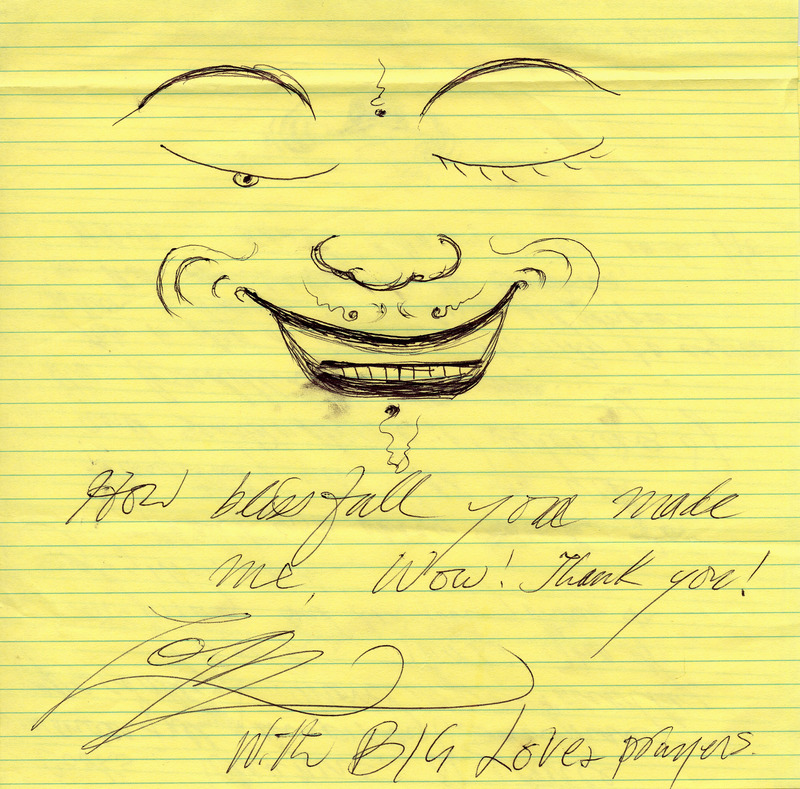 ‘We have Rinpoche’s fax posted on our staff noticeboard. Soooo touching and heartwarming. To think that Rinpoche would make the time out of his hectic schedule and precious life to write to us directly. ‘How are you? It was so good to see you taking care so well of all those people, you are a great examples of a director for the center directors, with kind heart, love and respect, caring, also smiling all the time, it doesn’t cost anything but it gives much happiness to people coming to the center, makes them open their hearts and enjoy the center, enjoy the Dharma, that brings them to enlightenment. ‘This is tea from Tushita, Maitreya’s pureland, by you enjoying this you get blissed out now and then later you go to Tushita. Thank you very much for many years dedication service to the teachings of Buddha and sentient beings and little mickey mouse, me. Because of all this achievements it gives meaning to your birthday today, that your life has been beneficial. This is not only celebrating being a human being up to now and being able to benefit and also continuously for you to be more and more beneficial in the future, starting from today. 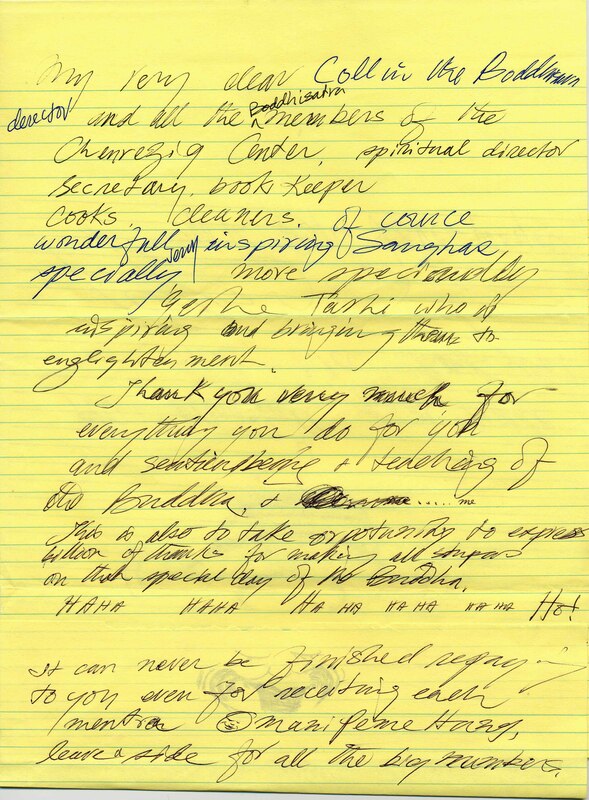 An excerpt from a letter written by Rinpoche to a benefactor who is helping to re-build Tibetan Buddhism in Mongolia, specifically by making a donation to create pamphlets to be available at the “State Statue” of Avalokiteshvara, as there are large crowds of visitors to this rebuilt state statue every day, so it seemed a perfect opportunity to offer (for free) a simple one page teaching on the Dharma to people who have made the effort to visit. ‘In Lhasa when the tourists come they have no books, nothing to explain about the statue, no pamphlets etc. and the monks don’t speak English, maybe one monk spoke a little English, so people who come to Lhasa to visit the temples and the major monasteries (Sera, Ganden and Drepung) who come to see all holy objects they have no one there to explain in English about the statues etc. no books or pamphlets. I thought it would be so nice to have a small pamphlet that explained the story of the statues, even though many of the tourists are new, but the pamphlet could explain the meaning of the statues and the stories behind them (like the one about the Shakyamuni statue in Lhasa temple) so these stories are very inspiring and the meaning of the story itself becomes a way to educate and awaken the tourists (even non-believers). Recently in Tibet they started to have small booklets in Tibetan, but I am not sure if they have them in English. So the tourists see things (like the statues) that they haven’t seen in their whole lives but they don’t learn anything about them. Another story is when I went to Drepung Monastery in Tibet there were some French tourists and they were so keen to learn, they were taking notes. They had a tourist guide, one young girl from the Chinese office, and she was explaining to them about the statue of Yamantaka, which is in the shrine room where there is also a Kalarupa statue – Kalarupa is one of the protectors of Lama Tsongkhapa’s tradition. Kalarupa obtains orders from Yamantaka. Yamantaka is the most wrathful aspect of the deity Manjrushri (deity of wisdom). Yamantaka not only is the deity of wisdom but also is the most powerful deity to pacify obstacles. When the Chinese tourist guide was introducing the French tourists to the Yamantaka statue she said that it was a ghost, she introduced the deity to them as a ghost or a demon. By her saying this it then means that in this beautiful monastery they built a big statue of a ghost or demon, so then that creates such a wrong image for the tourists, it must seem that the Tibetan monks were praying and practicing to a ghost. That Tibetan Buddhism is worshipping demons. So this means when tourists go to Tibet they hardly learn anything, also they don’t know how much of Tibet has been destroyed, how much was existing before, so no one explains even that aspect, besides going deeper into the meaning of the statues and the holy objects. One place that I helped in Tibet is in the area called Tagpo, this is not to far from Lhasa. There is a Palden Lhamo lake where the 14th Dalai Lama was predicted, as well as many other high Lamas, by the protector. You can say that this lake is Tibetan natural TV. When it is clear the vision is exactly like TV, it shows the answers to your questions about your life. There are many, many different lakes, such as the 21 Tara lakes, Mahakala lake, many, many Dharma protector lakes. There are incredible holy places, every mountain has a name of the Deity or a Protector, where their actual spirit is abiding. There are so many holy places where it is said that anybody who dies there does not get reborn in the 3 lower realms. At the monastery in Tagpo they gave me a book of the story of the whole area, which is unbelievably inspiring and amazing. I brought this to Nepal and tried to translate it as much as I could into English, then I sent this to them in Tagpo and hopefully they can show tourists and non-believers so they can get some education and insight into the holy area. So sorry this is just my side talk, that I remembered when you mentioned about having a pamphlet I suddenly remembered all this. PPSS: I am driving from Madison, Wisconsin where I just attend teachings with Geshe Sopa Rinpoche and we are driving back to Santa Cruz, California (2200 miles) to attend teachings with Kirti Tsenshab Rinpoche, I dictated this as we speed through the Colorado Rocky mountains on the way to Salt Lake City.